If you were a school-age child in the 1980’s or 1990’s, you almost certainly played The Oregon Trail. Thanks to its vaguely educational nature, it was a staple of school computers until the early 2000’s, creating generations of fans. Now that those fans are old enough to have disposable incomes, we are naturally seeing a resurgence of The Oregon Trail merchandise to capitalize on one of humanity’s greatest weaknesses: nostalgia. 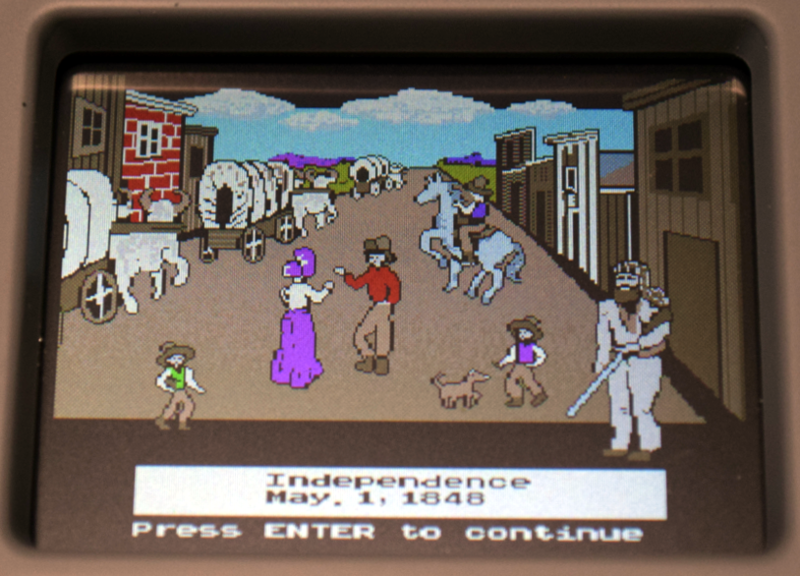 Enter the Target-exclusive The Oregon Trail handheld game. Priced at $24.99 USD and designed to look like the classic beige-box computers that everyone of a certain age remembers from “Computer Class”, it allows you to experience all the thrills of dying from dysentery on the go. Naturally there have been versions of the game for mobile devices in the past, but how is that going to help you when you want to make your peers at the coffee shop jealous? But we’re not here to pass judgement on those who hold a special place for The Oregon Trail in their hearts. Surely, there’s worse things you could geek-out on than interactive early American history. 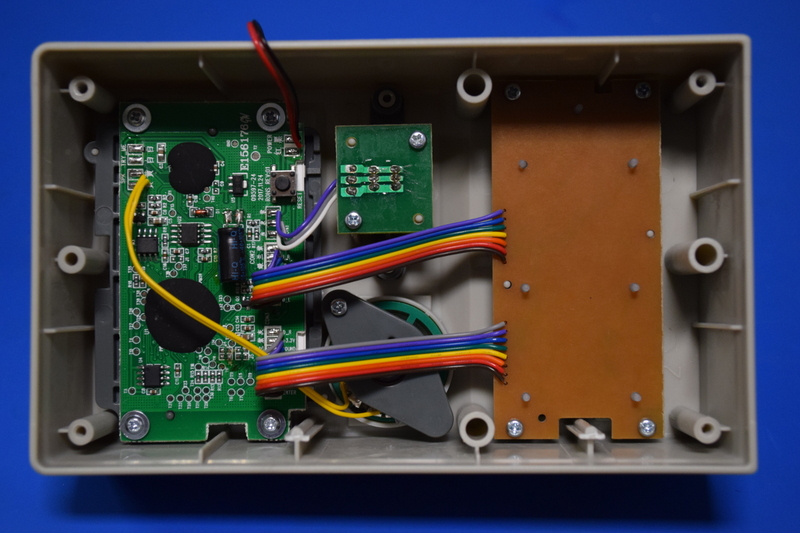 No, you’re reading this post because somebody has put out a handheld PC-looking game system, complete with a simplified keyboard and you want to know what’s inside it. If there was ever a cheap game system that was begging to be infused with a Raspberry Pi and some retro PC games, this thing is it. I would be remiss if I tore the thing apart without at least playing it for a bit and commenting on the system as a whole. I have to say, it’s pretty impressive given how cheap it is. The case feels strong, the buttons respond nicely, and I can’t help but love the satisfying “ker-chunk” the power button (the gray bar in the “floppy drive”) makes. That noise brings me right back to the days of DOS gaming on my 386. The screen is surprisingly sharp, though a bit dim compared to the smartphones we spend our days staring into. Even though it’s very small by modern standards, everything is perfectly readable and the graphics, such as they are, look great. Alright, now that we’ve put away our rose-tinted glasses, let’s see what’s hiding inside of this faux-PC. So the first thing you notice inside The Oregon Trail is that it’s absolutely cavernous inside. The case must be at least twice as big as it needs to be, the majority of the device is just dead space. You could easily fit the Pi 3 inside of the case, to say nothing of the Pi Zero. There’s also plenty of space to put a rechargeable battery, which is good because the three AAs that power the device aren’t likely to get you very far. To put some numbers to it, the inside of the case is about 140 mm long, 82 mm wide, and 40 mm deep. I really can’t stress how much open area there is inside the case, you could literally fill the thing with rocks and then easily screw it back together. It seems exceptionally wasteful from a materials standpoint, but absolutely fantastic if you’re trying to put extra gear inside. As you might expect, the main board of The Oregon Trail is hiding most of its goodies under black epoxy blobs. There’s a dizzying array of test points, but none labeled to say what they do. There are a few solder jumper pads which looked interesting, but after bridging them in different combinations I didn’t notice anything changing the game. I thought for sure they would at least change the language, but no dice. One of the devices on the board has had the label completely obliterated, but the other two were visible under the microscope. The HT24LC08 is a 1KB serial EEPROM, so if you want to hack the contents of your wagon, this would likely be the place to do it. I’m not sure about the other chip, G25Q80CW. The searches I’ve done have come up empty handed. Of course, the main board is likely to get chucked in the bin by anyone who buys The Oregon Trail to modify it, so we won’t dwell too long on the specifics. As for the screen, the flex cable is directly soldered to the back to the main board. The ID ZSX0243 is printed on the back of the panel and is even embossed on the ribbon cable, but as with the second chip on the main board, I haven’t found any useful info online about how one might interface with it. 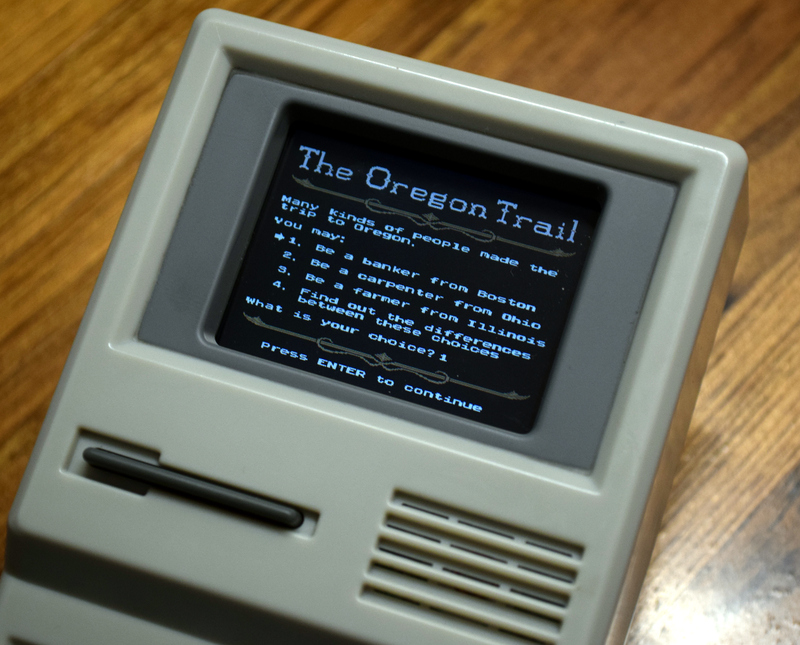 In what’s likely the most exiting bit of news, the keyboard on The Oregon Trail is exceptionally hackable. It’s a simple membrane keypad, and each wire is individually labeled for your convenience (on the keyboard and main board side). It’s ready to get soldered directly into the GPIO pins of your favorite microcontroller or SBC. The biggest problem I see is the rather limited utility of the keys currently on the game. The directional pad (with diagonals) is nice, but not sure what kind of mileage you’ll really get out of a “Wagon” button. The best bet might be to repaint the keys, or go all out and 3D print new ones with whatever iconography works for your intended purposes. Incidentally, remember that nostalgic sound I said the power button makes when you push it? 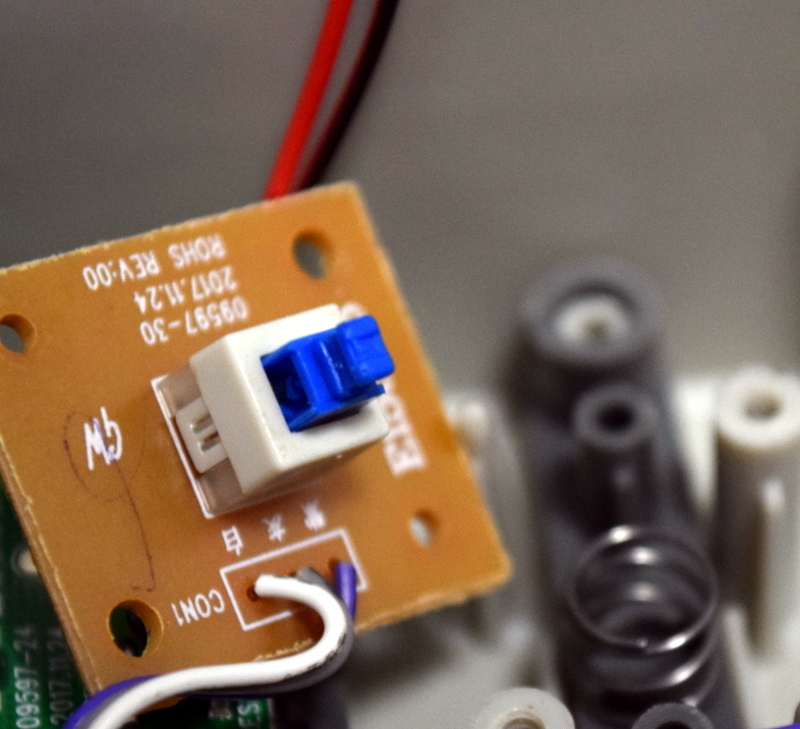 Come to find out, the reason it sounds like a computer power switch is because that’s exactly what they used, complete with spring-assist. I’d recognize that little switch anywhere. I don’t know if that was an intentional little detail on the part of the designers, or just the easiest way for them to implement a hard power switch, but I’ll take it either way. All told, the physical controls on The Oregon Trail should be very easy to implement into whatever project you might have in mind, and with a little cosmetic retouching of the keys, should make for a pretty slick setup. Playing The Oregon Trail for a bit was fun, and I think they did a respectable job of bringing the experience of the game back to life on this new platform. But the fact is, you can just play the game on your computer or phone every couple years when the crushing depression of real life forces you to relive your youth for an hour or so. By then you’ll remember we have YouTube now, and move on. I think it offers much better value as a platform for hacking. For $25 USD you’ve got a very cool looking case that’s got plenty of room inside, and a turn-key user interface that almost looks like it was designed to be re-purposed. Its even got a power button and speaker mounted and wired up. Honestly, the thing is nearly a retro emulator kit. Whether it’s bought by Millennials who are feeling nostalgic for their school days or hackers looking to tear it apart and make a handheld DOOM, I think Target is going to be laughing their way to the bank with this one. 25Q80 is a 1Mbyte SPI NOR flash. I would be surprised if the game ROM isn’t in there. Yeah, think you hit nail on the head here. If this board is really similar or even the same as the other NES-on-a-chip implementations, means the ROM can presumably be swapped out. Controls aren’t even too bad for generic NES games, really. I still think there’s much more to be gained putting a Pi and an LCD in there than changing the NES ROM, though. Why not both? If you can find the reset pin on the NOAC, you can have the Pi rewrite the flash with new ROMs. If you can find a serial port or some GPIOs, write a NOAC application to slave the display to the Pi. Would be an interesting academic challenge, but doesn’t make much from a usability standpoint. The Pi can run dozens of games/emulators that would work well enough with the controls available on this device, so why limit yourself to just the NES? I wonder what kind of CPU is hiding under one of those blobs. NES on a chip? yeah, it’s a famiclone chipset. the game is a hacked up version of Oregon Trail for the NES. So you mapped out The Oregon Trail? My great, great, great grandfather is attributed in some places as helping to map out the real Trail. All those fur traders and explorers mapping things so people could later follow. Hackers versus consumers, one not needing maps, the others not even going the route without a wagon master. I half expected to find a 6502 inside there. Obviously the all important magic smoke! It’s a Famiclone, same as their mini arcade cabinets. Looks to be a similar if not the exact same board. Maybe it’s a simple port? LGR did a review of the Oregon Trail, 8-Bit Guy did the arcades. Qbert and Centipede are even on the same board, jumper selectable. Ok. Didn’t mean to do that. Pretty neato and I had not heard of this but like tfa said it is probably best left to an occasional revisit. What? Millenials who happened to be time travelers as kids maybe! The rest of them probably wouldn’t know how to insert the floppy! That’s a Gen-Xer’s childhood memory there. You know… the people everyone forgot about. No, I was born in ’88 and my computer class in elementary school had Apple ii’s. We got upgraded to Macintosh in the fifth grade. I played lots of Oregon trail as well as the incredible machine. It all depends on how crap your school’s budget was. I was ’84, and our elementary school had 486DX66 with the qbasic gorilla game. I had TIM2 at home, and other games like Stunts. Aw, I remember that game. I learned to code by studying the source and using the reference manual built in to the editor. Is this the same one with those yellow bananas? I miss old QBasic. ’89 chiming in here. similar experience. rural US educational institutions held onto old gear for a long time back then. probably still do. My high school took delivery of a NEW Apple IIe in 1993! It was literally one of the last ones to roll off the line, but the ][ and C-64c were both still in production at that time. Doesn’t that make you a member of Generation-Y? I thought the Millenials were born from somewhere in the mid 90s and into the zeros. I guess I can’t say how much longer ‘my’ school kept that same computer setup after I left but keeping in mind that it takes some years to go from being born to playing a computer game I have a hard time imagining that nothing changed! Of course generations don’t really mean much since there is no real definition for these things. Everyone’s ideas on where generations begin and end seem to vary. Born in 79, everything I have ever read puts me in Gen-X although most versions put me in the very tail end of it with most Gen-Xers being too old to be what I would consider to be peers and vice versa. We had Apple IIs with Oregon Trail in my elementary classrooms. It was a fairly rural, low budget school and I remember everything (and I mean everything!) being very yellowed with age even then. I was under the impression that hardware and software started with people that came much earlier than I. Well ex-cuse me Mr. My School Had A Budget. Also floppies were well in use until 2000 or so, especially if you couldn’t afford a CD-R drive; you can bet I have memories of saving my school papers only to find that the floppy had corrupted somehow in the short distance I walked upstairs to the printer. A good replacement for Hypercard is LiveCode. You can build everything from simple stacks all the way to iOS and Android apps in a very familiar environment. sorry grandpa, we still had floppies when I was a kid. I was born in 1988. I had to buy blank floppies from the College bookstore in 1998. Until USB thumb drives were ubiquitous we had to store our term papers on magnetic sheets of plastic. Not sure what you’re getting at, but millennials are defined as the generation born between early 80’s and mid-1990s. So exactly when this game was at its peak popularity. Perhaps you are thinking of children born AFTER the millennium. I was born in the early 80s. Growing up I always thought I was a Gen X, but apparently the definition now is that a Millennial is someone born sometime in the early 80’s up till the early 2000s which seems overly broad to me. Not to mention that the landscape has totally changed with the introduction of the Internet, which really started getting popular in the late 90s. Funny. We Gen-X-ers were always told that you folks were “generation Y”. Don’t know why “millennial” doesn’t mean people born around the time of the turn of the century/millennium, but who am I to argue? that’s what millennials are. Kids born in the late 90s…those that have never lived in a world without the internet or smart phones. I am a proud Gen X 80s kid. Wait, Y’all didn’t have time machines as kids? I was born in 2261 and I played Oregon Trail while on the Oregon trail. Didn’t they hppen at the same time? Anybody else wondering if Target’s April 1st product page was activated a bit early? Next all the adult stores will be selling “Leather Godesses of Phobos” games using pretty much the same hardware! You say this as if it would be a bad thing. Or Leisure Suit Larry in the Land of the Lounge Lizards. Well, if the CPU is a 6502, dump the SPI ROM, find out how the screen is controlled, then write your own code. Since it’s a “Famiclone”, I’m guessing it’s just parallel RGB with NTSC- or PAL-like timing. Likely not enough pixels to do much with, though. You’re probably better off trying to find another TFT with similar dimensions. I hope so; I’d love to find a cheap 320×240 LCD that had parallel raw RGB in. I can only seem to find 320×240 LCDs that have a 16-bit parallel controller in them already, or 480×272 raw RGB LCDs. Yeah, but you can see the nearest-neighbor upscaling in the town view. If 3.5″ will work, LQ035NC111 is a readily available type (about $10) that I’ve been using with my FPGA projects. It’s a 320×240 display with RGB/HS/VS/Dotclock inputs that doesn’t require initialization via the SPI interface. There are several other types that have RGB interfaces but require initializing over SPI to put it in that mode. It would be great to turn the floppy / power switch into a SD/MicroSD card slot. It is 7.5″ tall. Can’t beat it for $30. That’s been around for a while. Lots of empty space inside, easy hackable controller board, 300 crappy games that looks like leftover games from high school coder competitions. There’s a 1KB Serial EEPROM in I2C mode which is for saved games. It’s pretty easy to page write and give yourself 65535 bullets, etc. Not everyone can be Ben Heck… The original article gave me all the info I needed to plan my mod to make it take a USB game controller. This is literally the same information in the article, save for the fact that Ben apparently was able to pull something off the larger EEPROM. Everything else, down to the unlabeled IC, is written above. So not sure what you were reading. But more to the point…who even cares. How many people are going to try replacing the ROM on this crusty emulator chip compared to those who will just throw it away and put a Pi in it’s place? I was just about to go down the same path of removing the EEPROMS to dump! You saved me a bit of work. These PCBs are the same as the other Bridge Direct arcade cabinets with a few component layout differences, such as the secondary EEPROM for the saved games in Oregon Trail. In the past couple of months I’ve dumped the firmware from the Rampage, Centipede and Joust units and dug into the code. These units are VT-03/05 famiclone NOAC chipsets and modified NES roms with such mods as: Rampage romhack’d to add in Ralph as a playable character, the NES controller instructions for Rampage were purged, and the 2nd player option text in Joust was removed. Centipede & Q*bert: Share the same PCB and can be changed to either version by bridging a jumper. Joust & Defender(Stargate): Share the same PCB and can be changed to either version by bridging a jumper. Since the Joust cab doesn’t have the extra button for the smart bomb deploy for the Defender ROM and Rampage does, some folks have swapped the EEPROMs between the Joust and Rampage units with zero issues. Most of the dumps are in VT03 ROM PPU/CPU layouts but can be hacked playable by striping out the extra kernal-ish code and adding some of the NES headers. With a bit of hex-editing I was able to get Joust to boot and play in the emulator Nintendulator with the Bridge Direct intro intact. I could go down the rabbit hole on the TinyArcade units, the MyArcade Data East mini cabs or the recent RetroBit Generations consoles but those are a different topic all together. First Post! Hey Ben! Long time lurker, first time poster. Just because the poster is placed Ben Heck’s website in the comment form and is using his name is not proof it is The Real Ben Heck ™. If you sign in with a registered WP account / email, there’s a password between you and forging someone’s identity — that’s what the yellow account names mean. So that evil hacker, who posted exactly the kind of stuff that Ben Heck would post, has apparently taken over Ben Heck’s account. Or… Occam’s razor. Wait, so I might not be Olsen? Also, If it isn’t Ben, it would be someone with similar notoriety for being able to spoof email. Maybe a uC ASIC hybrid like the C64DTV which actually used an Atmel CPU to emulate the 6510. It’s probably some kind of Cortex M0 such as those made by STM or Cypress which would be cheap enough for the BOM though since it’s probably made by a Chinese supplier it’s probably a clone like the GD32F103. It would be interesting to decap one for science. Since the NOAC was invented for things like 900-NES-games-on-a-joypad, there’s no need to have a shift register on the controller, and another in the chip itself. Just run the thing in parallel. It’s not an actual NES, it’s a custom chip. Similarly 85MHz would be too fast for 1982 technology, but NOAC isn’t original NES stuff. You’ve got the CHR and PRG ROMs, that’s 16 bits of data, and both of them streaming constantly if you want the thing to work at all. So if it’s a modern flash chip with 4 serial channels, and including the need to send a load of address bits now and then, 85MHz might scale down to be just about right. Maybe a little fast, but it’s 2018, it’s no challenge. Not 1982. Not ACTUAL NES stuff. But yeah, we find probably a site per month that’s just ripping off our content. We sic the lawyers on them and then they stop. Cheap handheld games are still made like this. All have a COB under epoxy. If you can dump the ROM you can write a remote debugger and RE the COB through register and RAM dumping. Clock glitching is also an option but is only really needed if there is some crypto on the ROM. IMO the architecture is always boring and too slow for most projects, but looking through the ROM disassembly is fun. I’ve tracked down the original coder through strings pointing to companies and even street addresses before..
Something roughly equivalent to a STM32 F4 would be pretty useful for a lot of projects heck even a fast 8051 or Z80 core could still be pretty useful. It looks more like DOS version. comparing the screens it is almost certainly the DOS version. The image of a river with a tree on the right matches up. And the image of man in a red shirt standing in the street of Independence, Missouri is, to the best of my knowledge, only found in the DOS version of the game. I can only assume the chip on this board is running DOSbox and a RISC cpu, or it is emulating an 8088-class CPU. I doubt it is the later as the development costs would be significant. @josiahgould look if there is a third alternative them I’m all ears. I have two very reasonable thoughts. How was removing and putting back the screen? Mine came with some dust between the LCD and the protector and I’d like to take care of it without returning it. I saw a couple videos online that said the same thing. Once you take those four screws out of the main board, you can just push the screen in from the front and the whole screen/board assembly comes out. You can then take the protective plastic piece off and clean it with a lint free cloth or something. It’s interesting to note that there’s actually a rubber o-ring between the screen and the front of the case, presumably to keep dust out. Doesn’t appear to be working all that well, but I was impressed they tried. Wow thanks so much for the quick response and help. I’ll take it apart soon and let everyone know how it goes. Article was great by the way and my GF is loving this handheld. Great article by the way, we’re going to go out and buy 2-3 more so we can each have one and do some mods on another. except that millennials were born in the late 90s to early 2000s. GenX is from the late 70s to the very early mid 80s. Millennials are people who have always lived in a world where the internet and smart phones existed.